As we age, the fat and collagen underlying our skin begins to diminish due to genetic and environmental factors. Therefore, the skin starts to sag and develop wrinkles. Dermal fillers are commercially developed products, which are injected under the skin to address wrinkles and volume loss. There are two major groups of dermal fillers: resorbable and permanent. Collagens (Cosmoplast, Evolence), hyaluronic acid- based fillers (Restylane, Juvederm) and calcium hydroxyapatite (Radiesse) are resorbable, because the skin has enzymatic systems to degrade them completely. Therefore, any side effects, if occurring following their injections, are temporary. Permanent fillers are synthetic materials, therefore, human body is devoid the ability to degrade them. Side effects following permanent filler can last indefinitely. Common side effects of dermal fillers include bleeding or bruising after the procedure. Patients should expect some degree of pain during the injection and redness for up to 36 hours after the procedure. Application of ice to the injection sites can decrease these symptoms. Historically, double skin testing was required prior to bovine collagen (Zyderm, Zyplast) injections to lower the incidence of allergies. None of the modern fillers require pre-injection test, because true allergic reactions are rare. Superficial placing of hyaluronic acids can create bluish discoloration of the skin due to Tyndall’s effect (Figure 1). 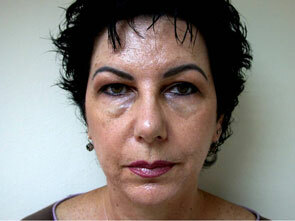 Water absorption by this filler can create swelling especially under the eyes (Figure 2). All of these can be treated by hyaluronidase – enzyme degrading HAs. Uneven injection of Evolence can create long lasting lumpiness. Infections, inflammatory reactions, and granuloma formation are the major side effects of permanent fillers. Those are treated by systemic antimicrobials, intralesional steroids, or surgically.